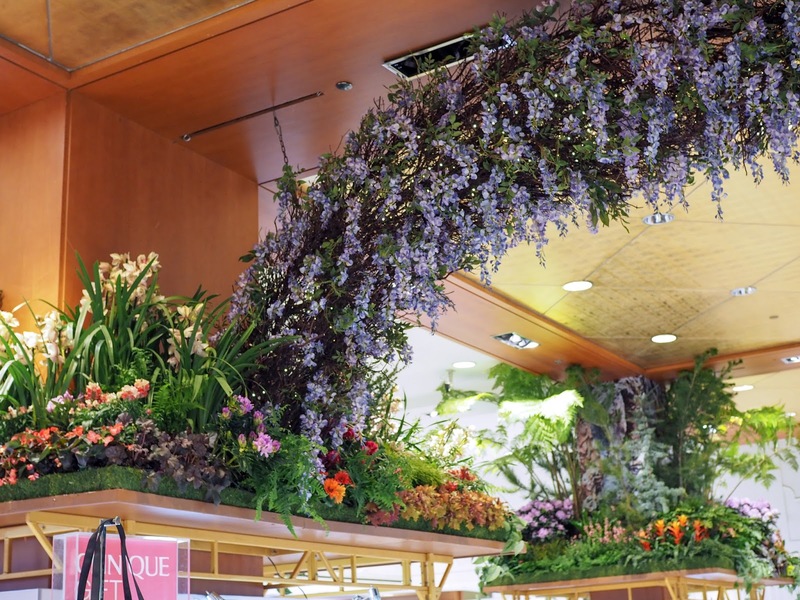 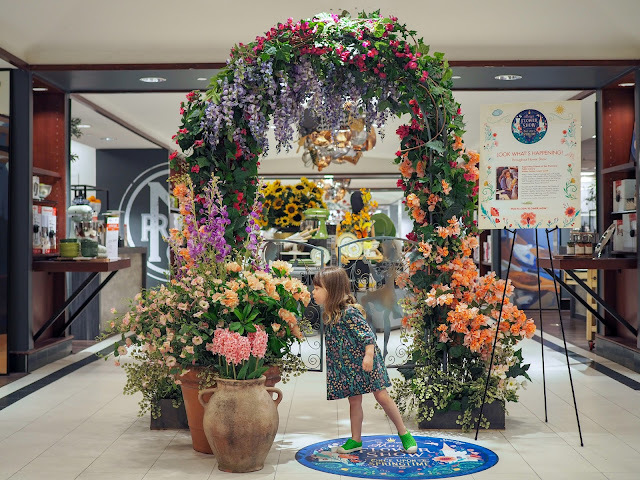 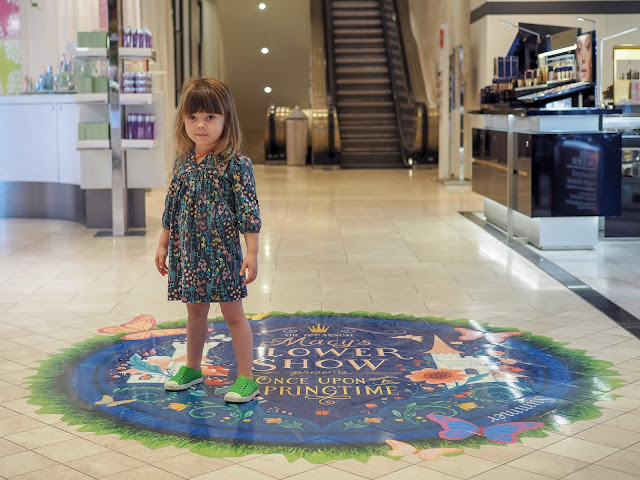 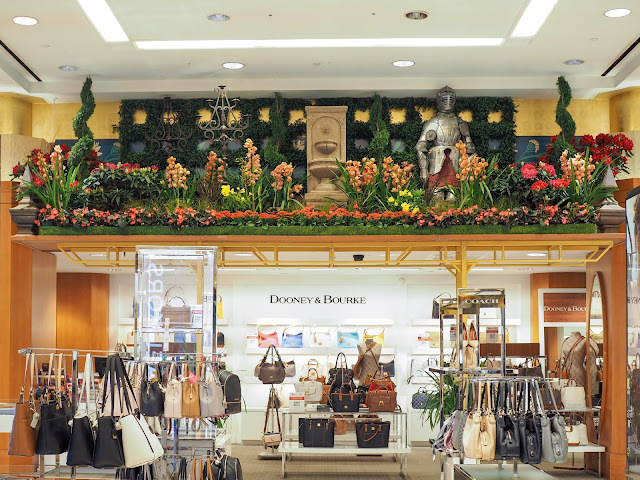 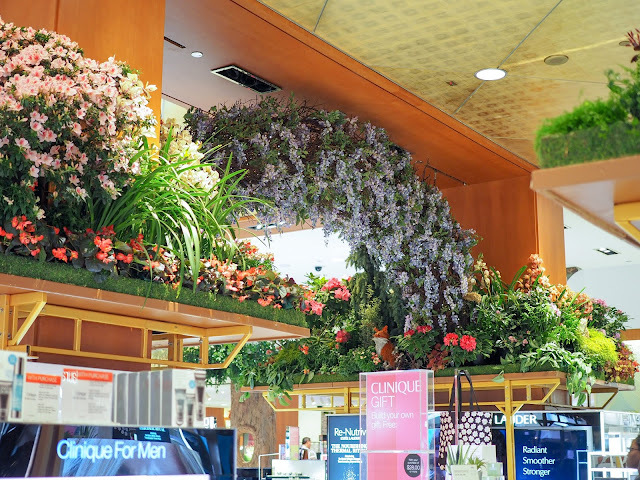 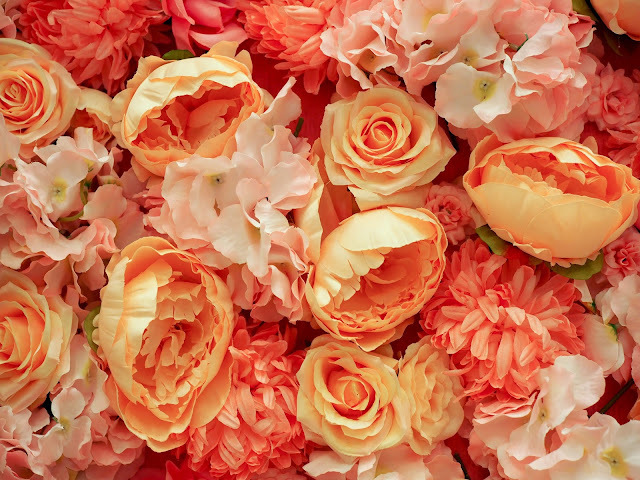 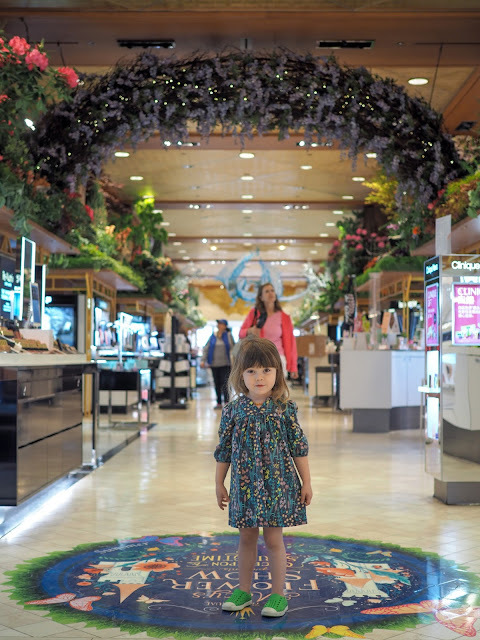 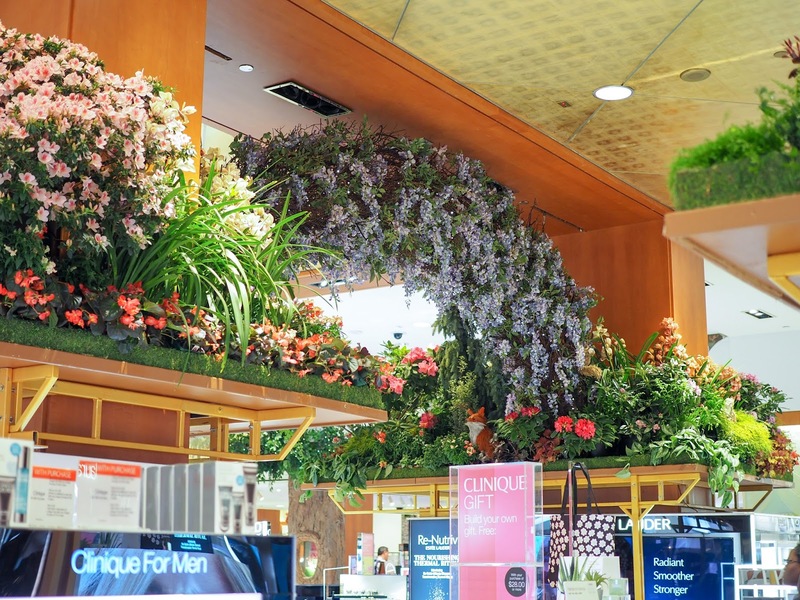 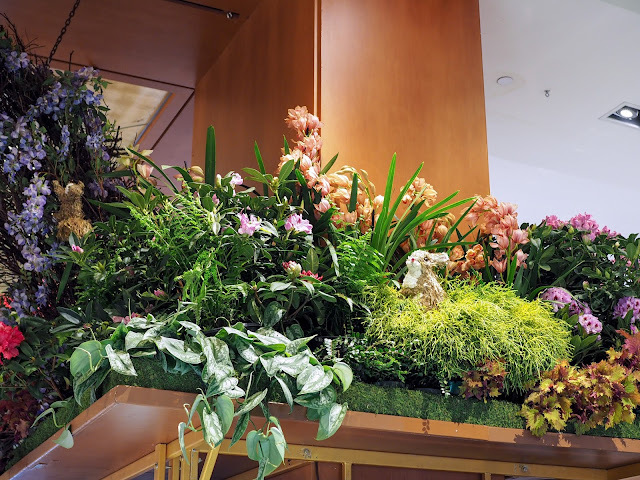 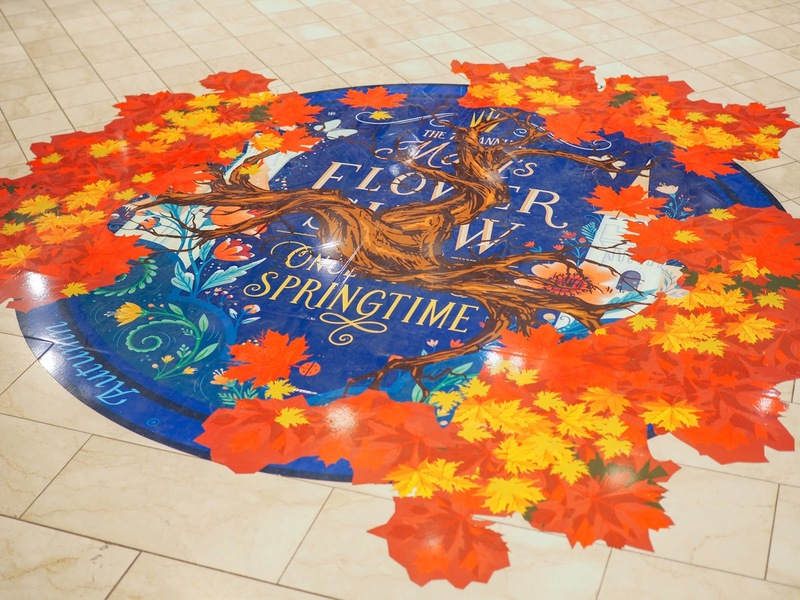 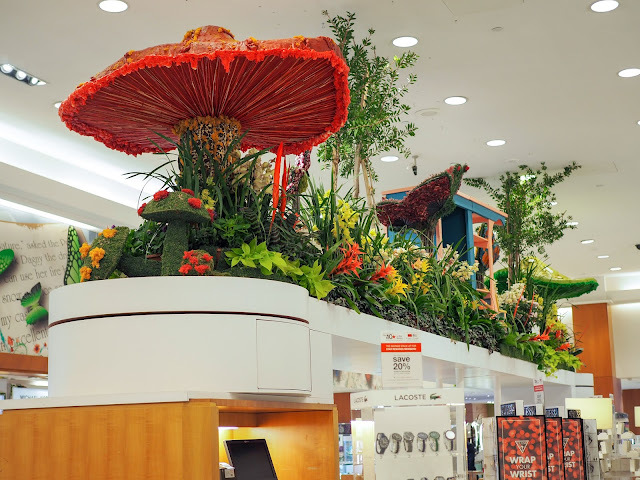 Every Spring selected Macy's stores around the country celebrate the coming of the new season with a beautiful flower show. 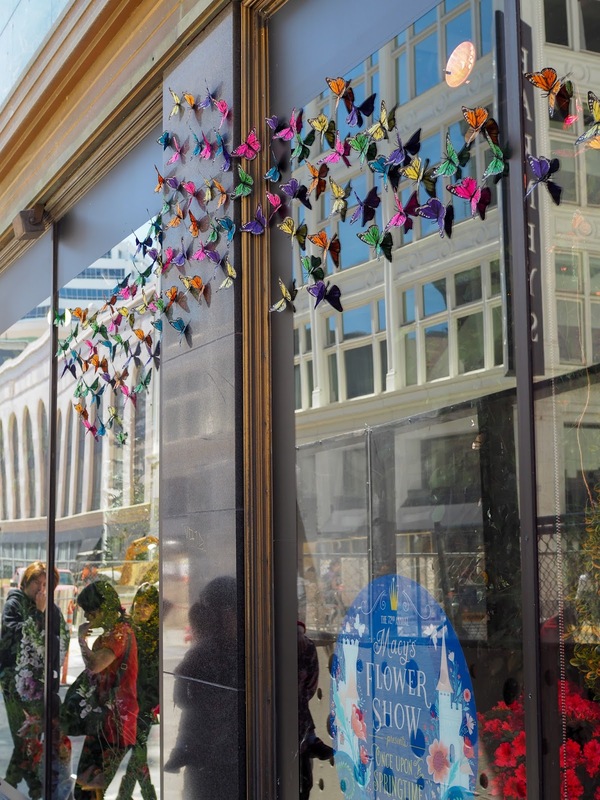 San Francisco's flagship store is one such location for this display, and every year I make sure to check it out. 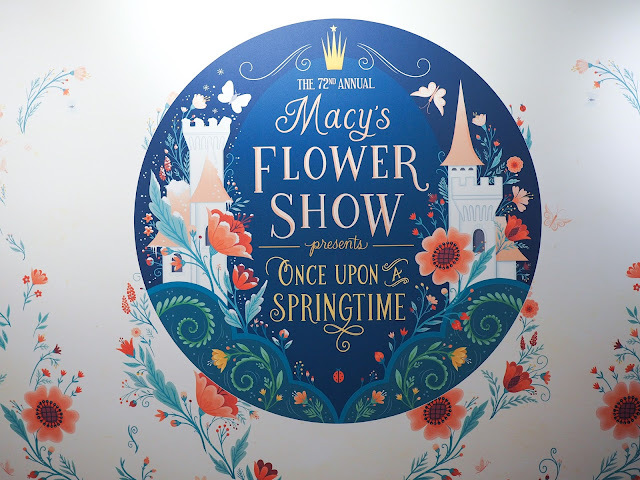 This year's show is on right now, so Mathilde and I headed into the city to check it out. 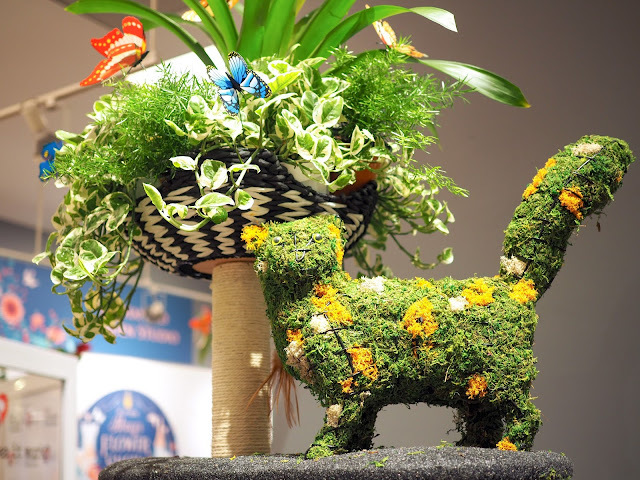 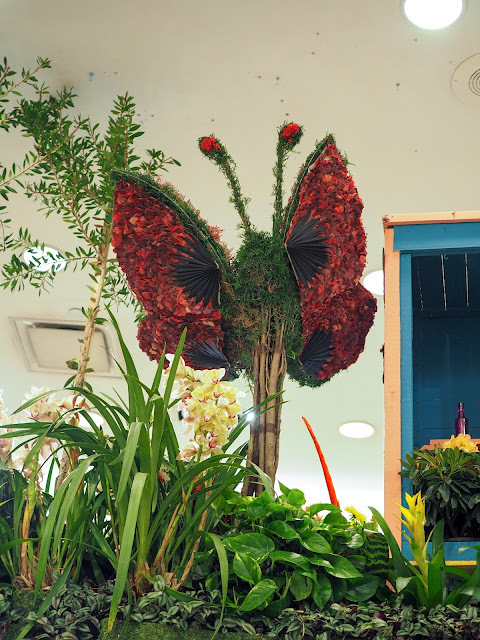 Each year the flower show is based on a particular theme. 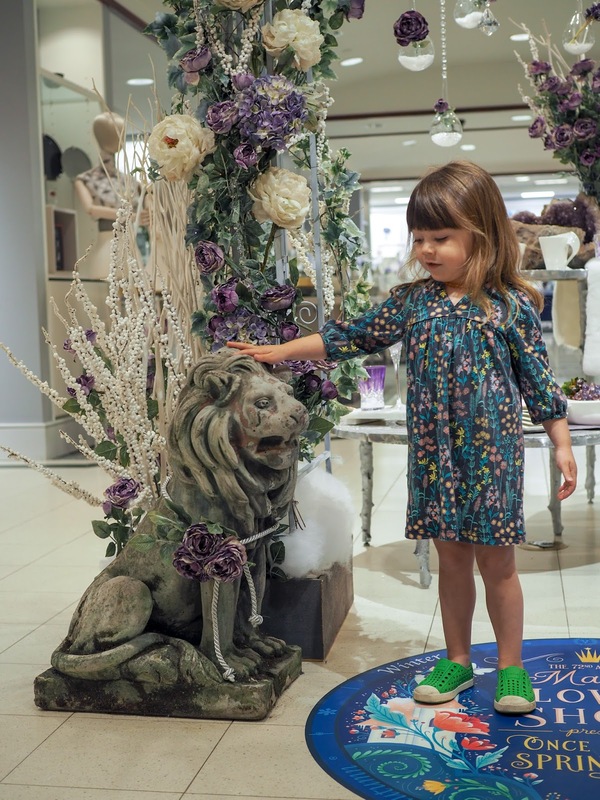 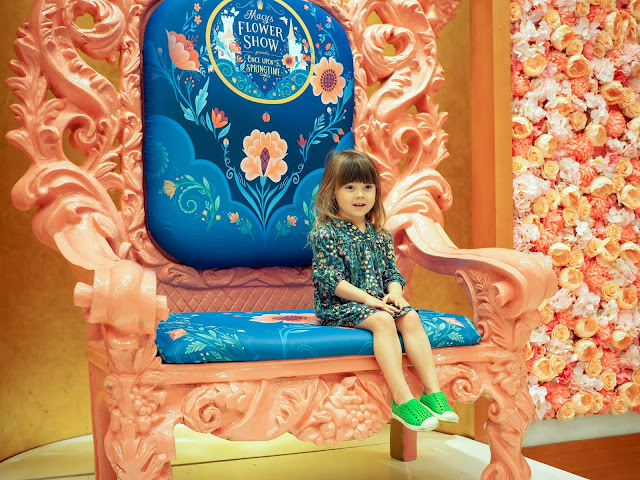 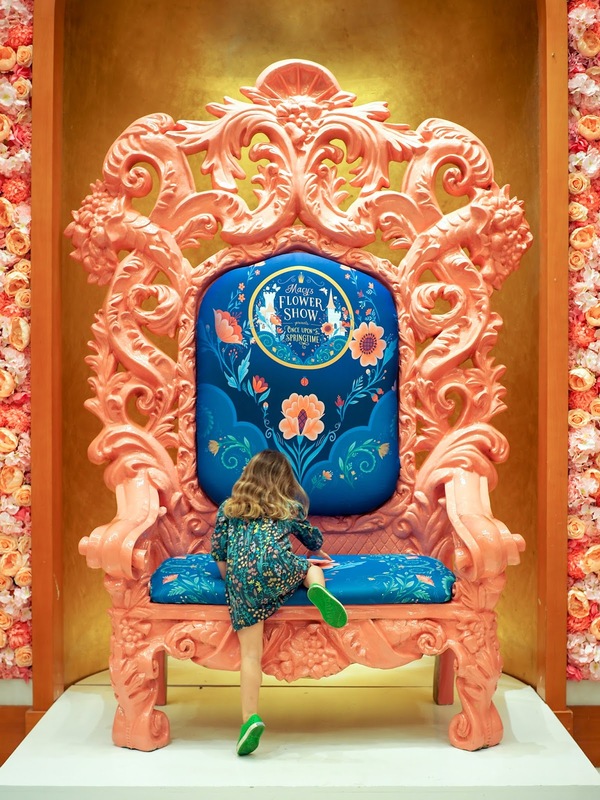 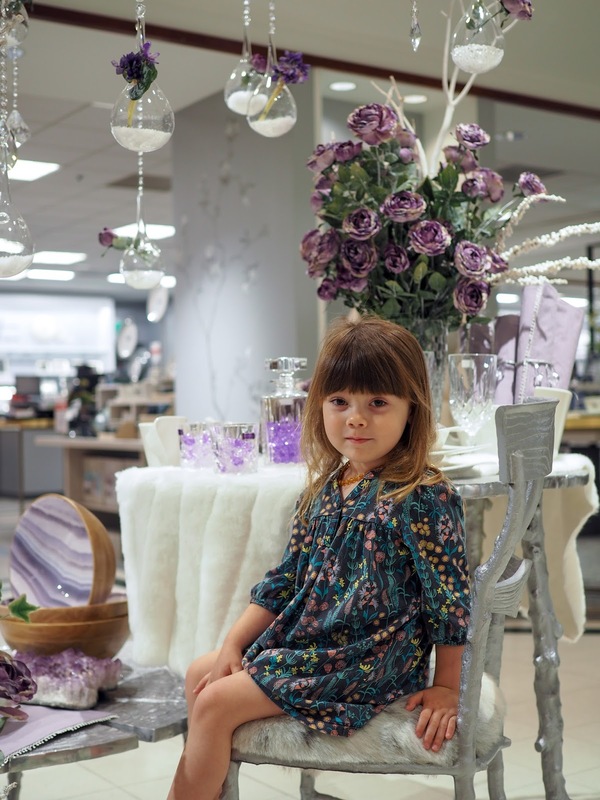 This year's theme is "Once Upon a Springtime" and features magical fairy tale inspired displays with woodland creatures, a dragon, knights, a castle and a big pink throne for visitors to sit on. 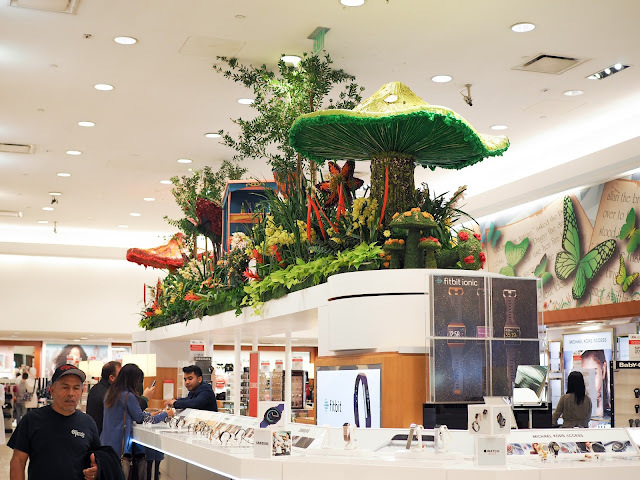 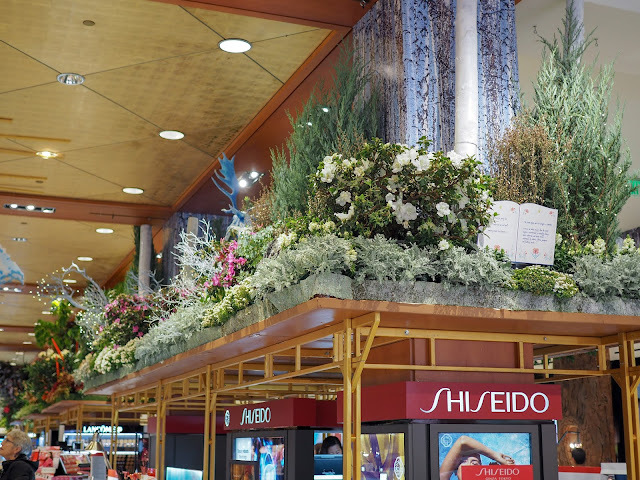 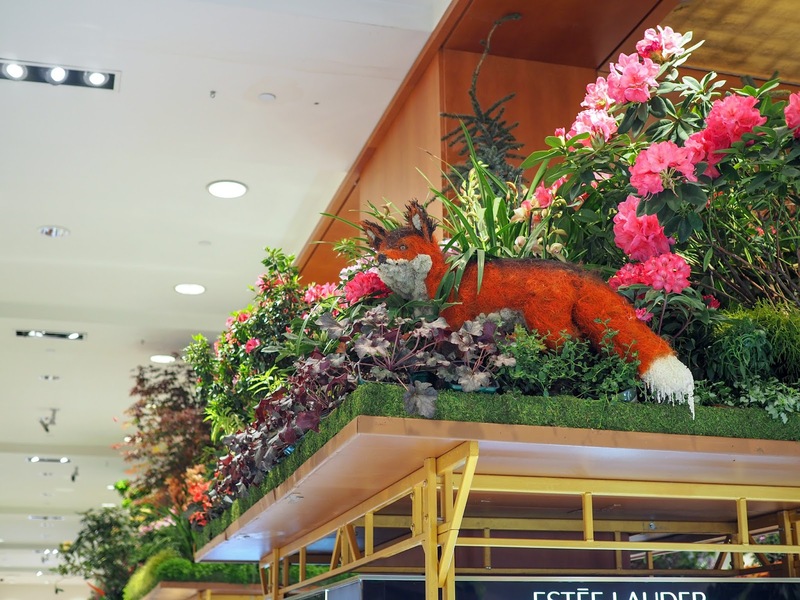 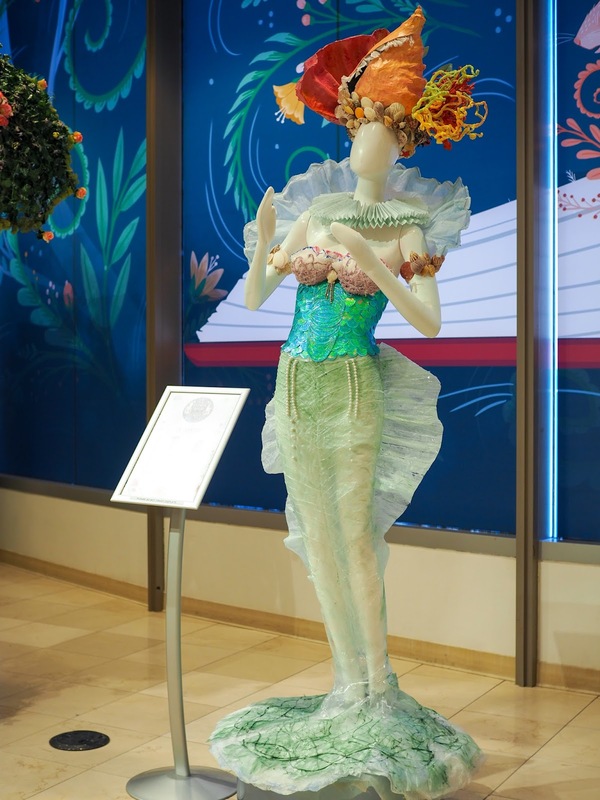 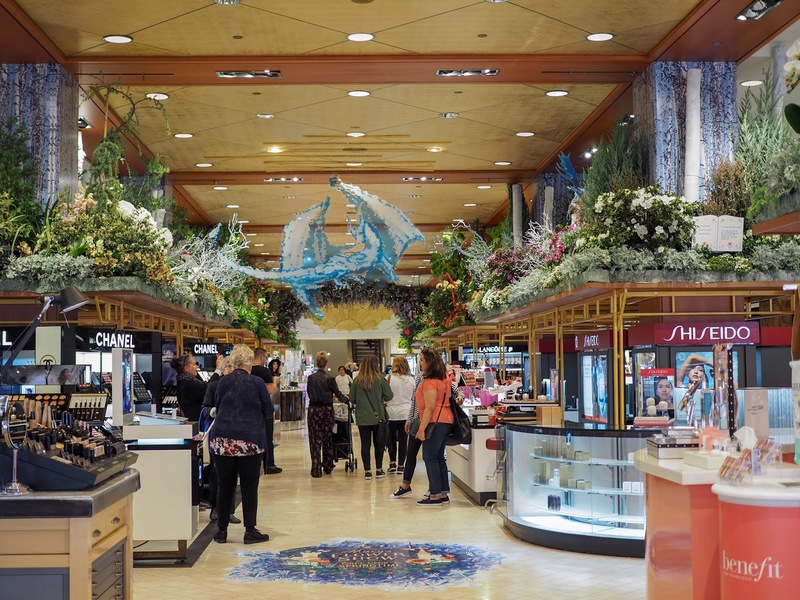 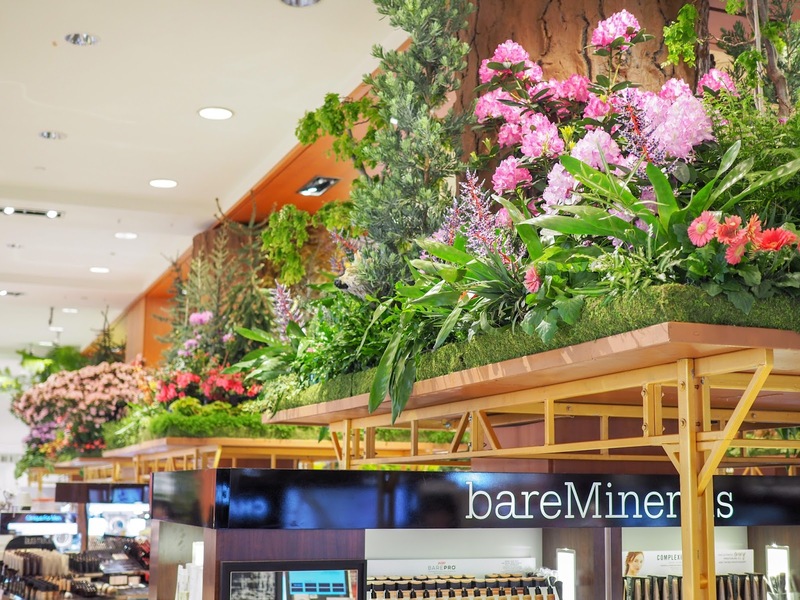 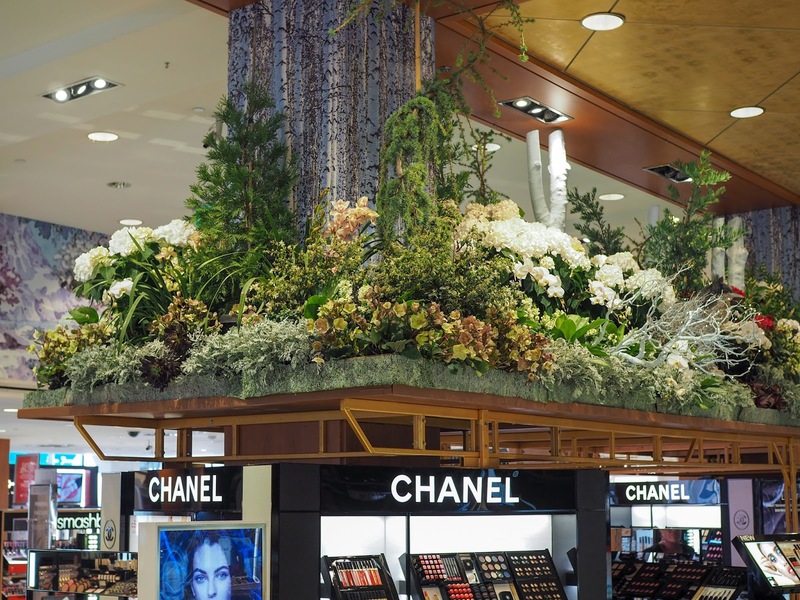 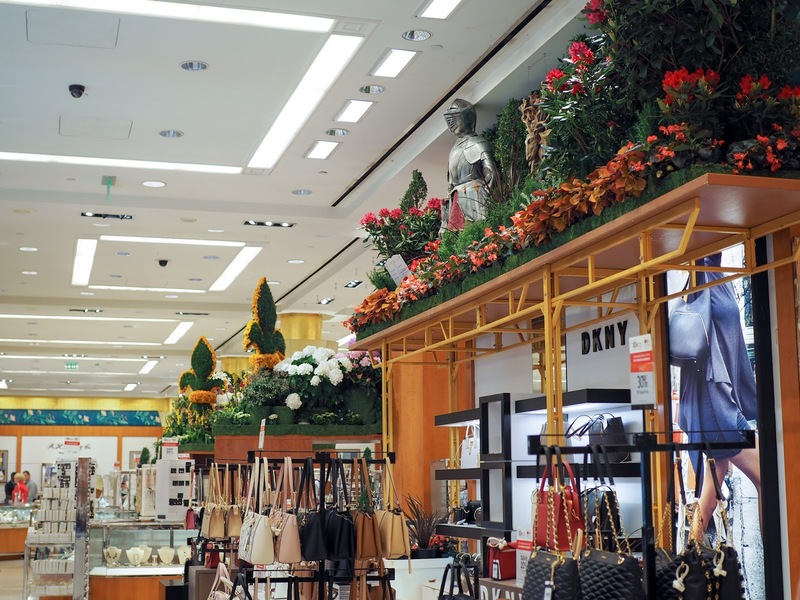 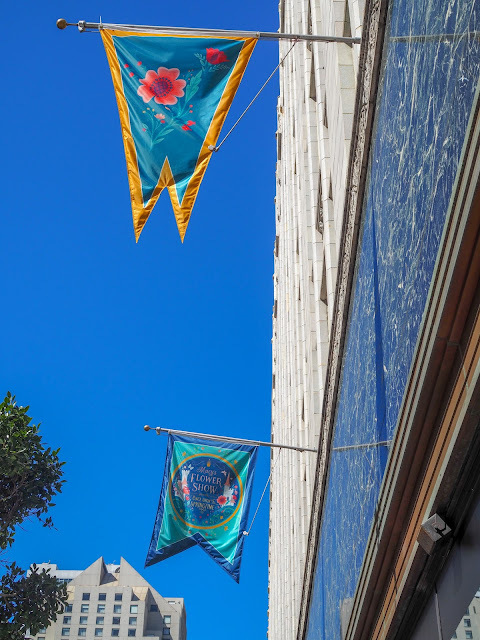 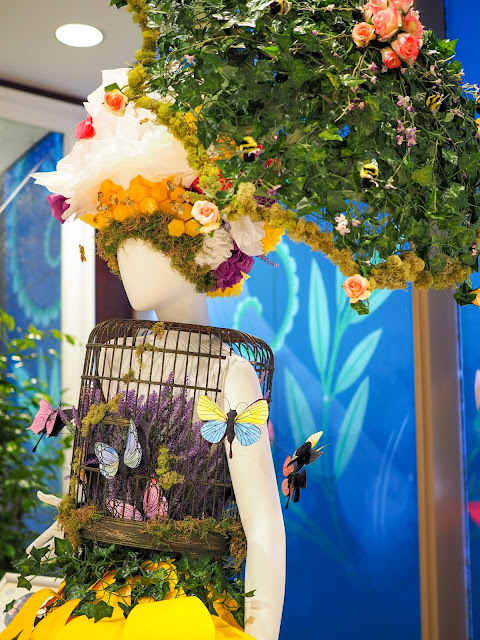 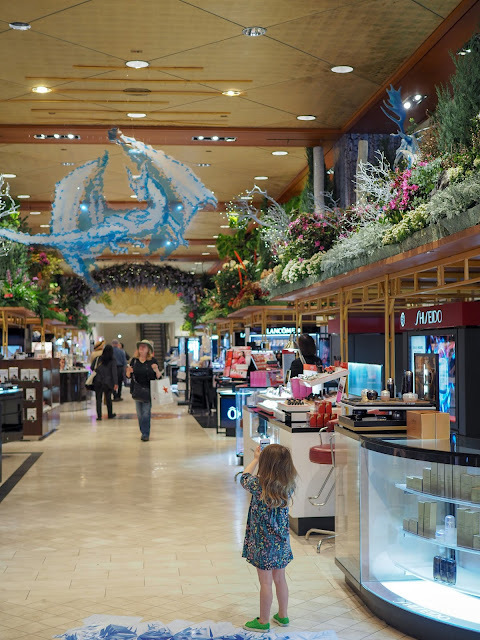 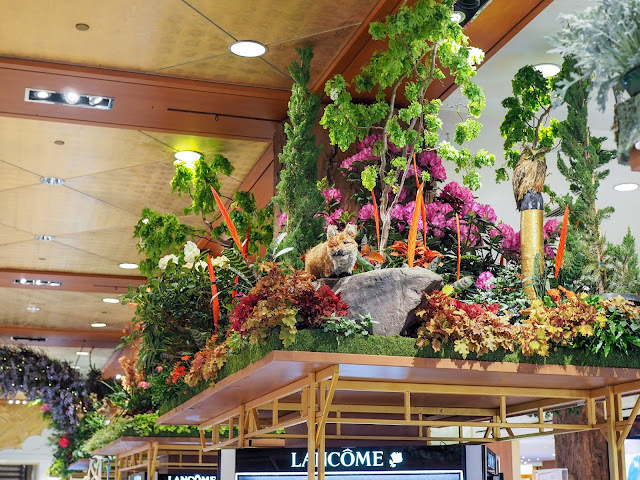 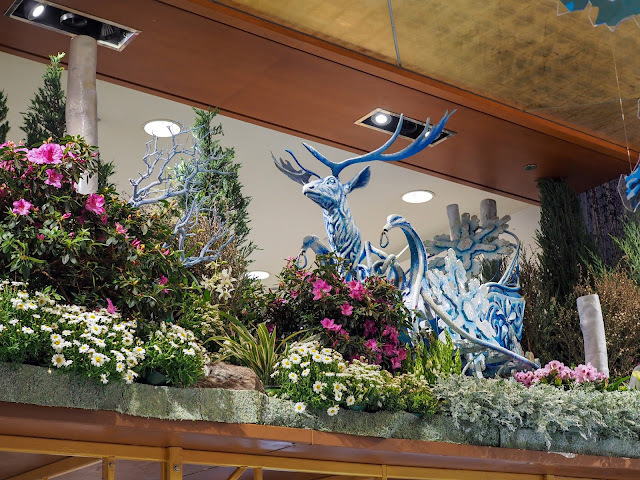 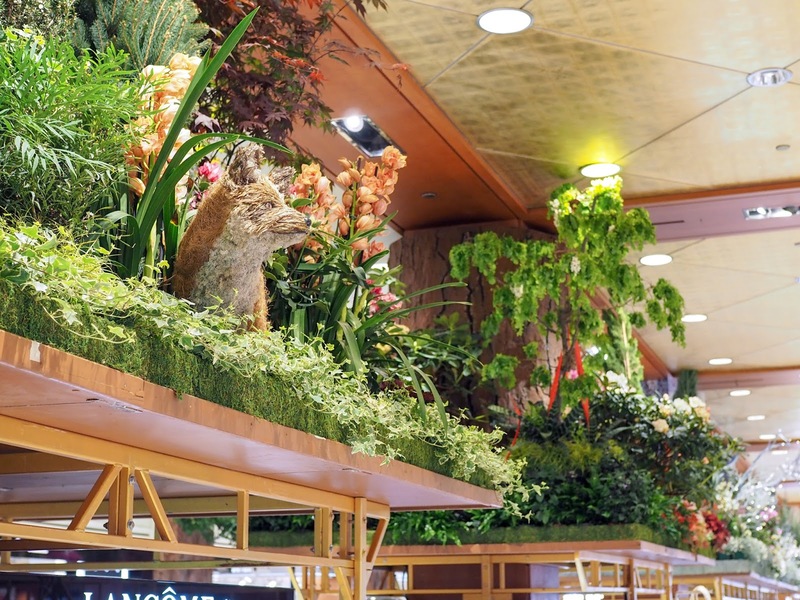 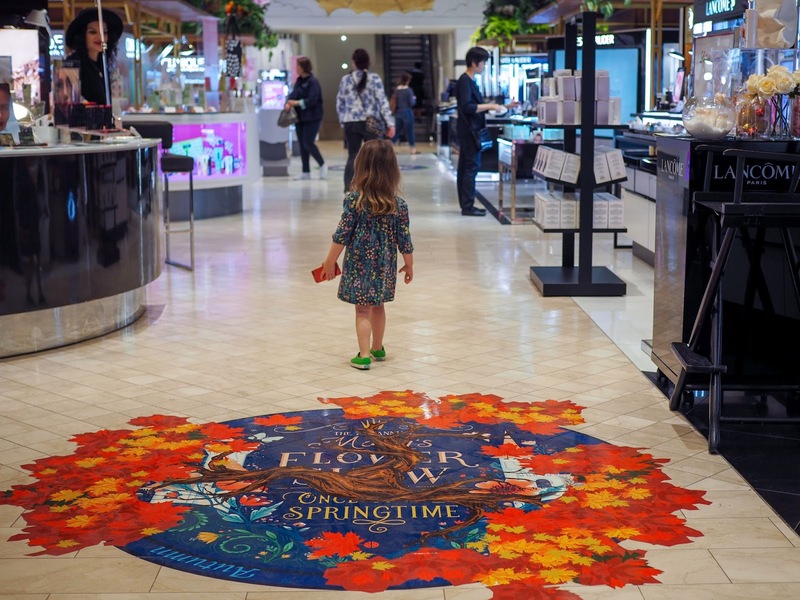 The displays are mostly located on the first floor through the cosmetics and accessories departments, and change from Winter to Spring as you walk through the store. 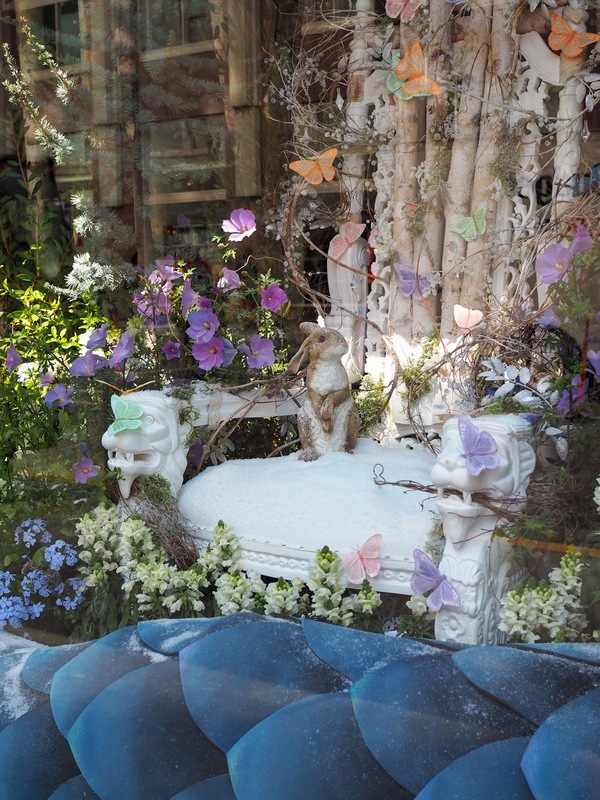 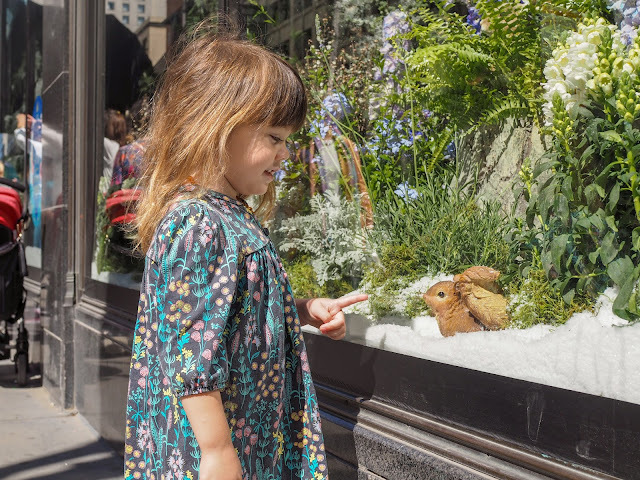 First up, Mathilde and I checked out the window displays on O'Farrell and Stockton Streets. 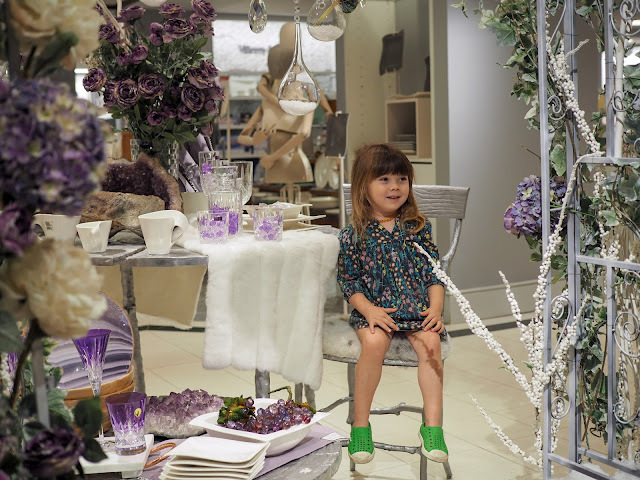 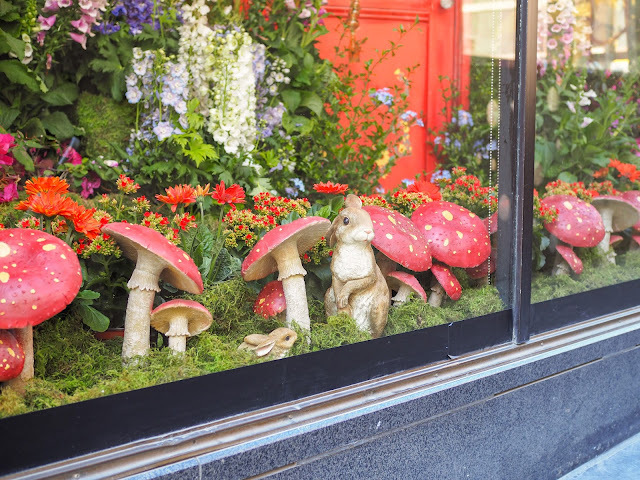 Mathilde was captivated by the cute creatures hidden among the toadstools and flowers. 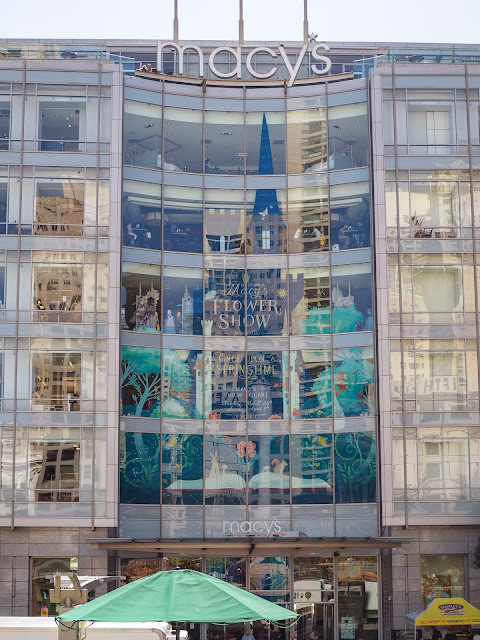 The corner window contains a giant book and a waterfall, but given the harsh sun during the time we visited I was not able to capture this well in a photo. You'll just have to go see for yourself! 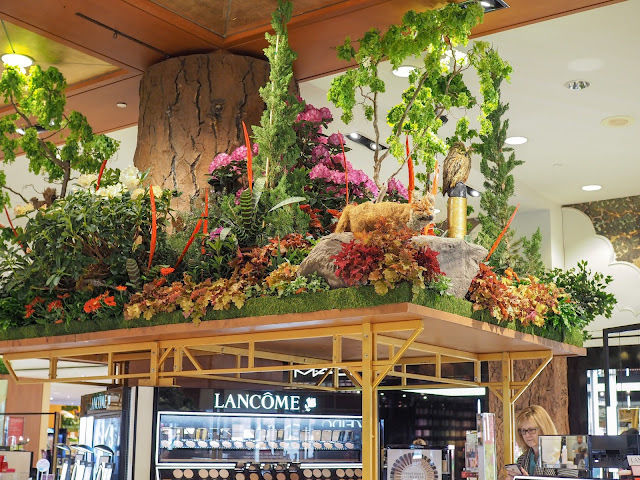 We then headed into the cosmetics department and took a walk down the central aisle where the main display is located above the cosmetics stands. 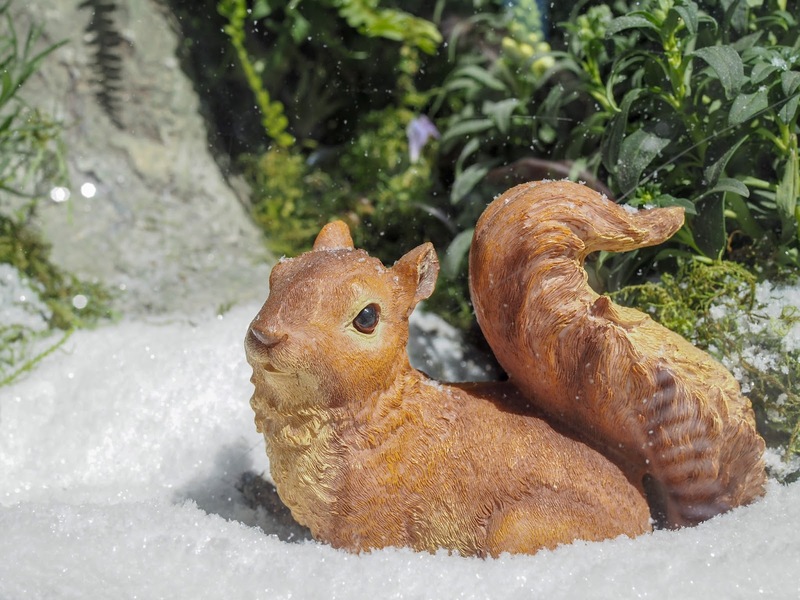 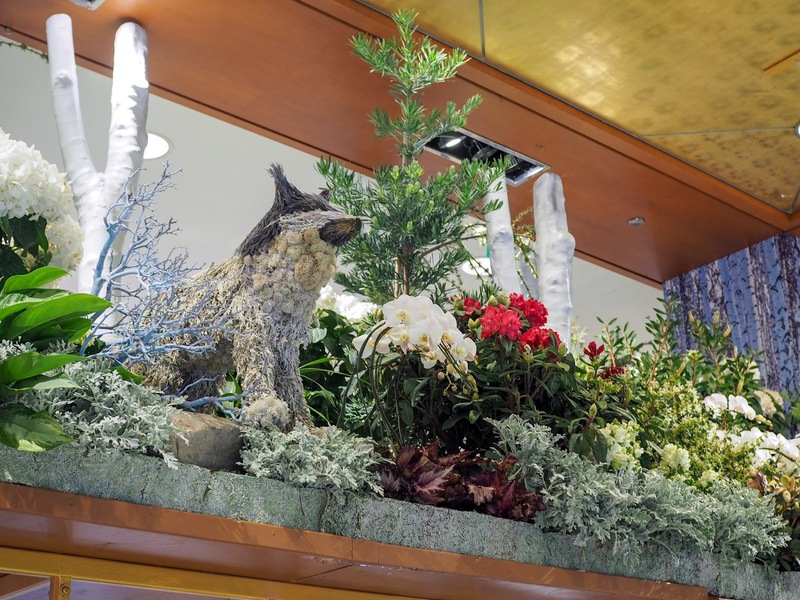 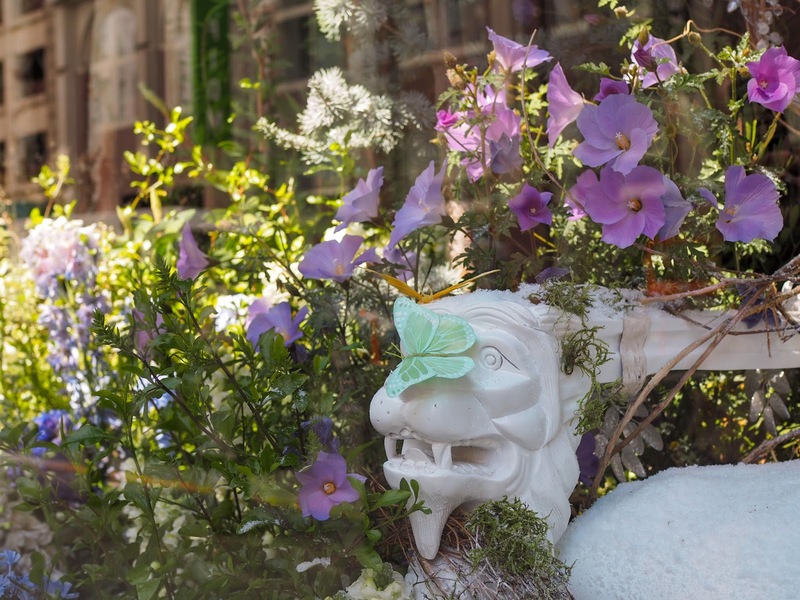 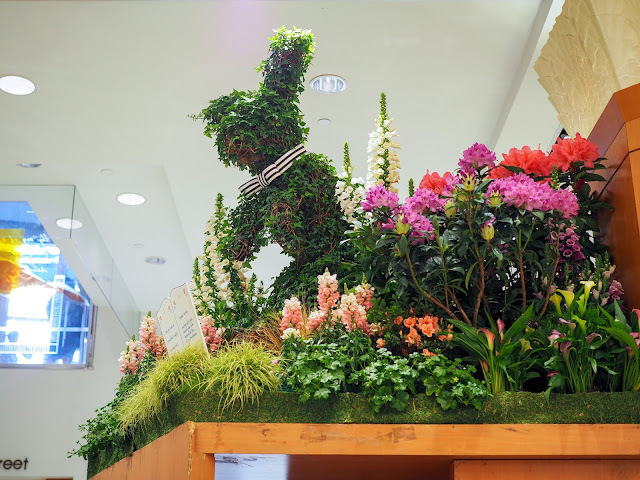 Just like the window displays, these displays feature forest creatures among the flowers and plants. 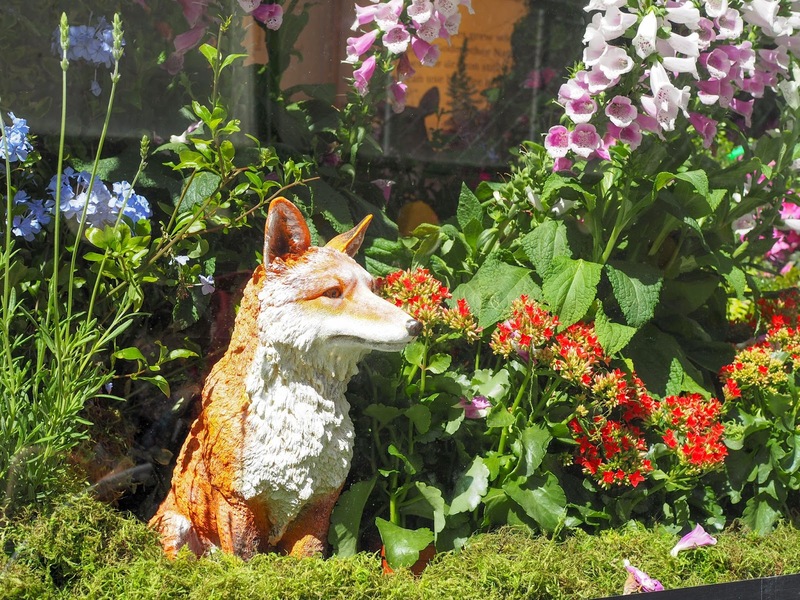 We saw foxes, rabbits, owls, frogs and even a skunk! The center of the aisle features an icy dragon hanging from the ceiling and an arch of delicate purple flowers. 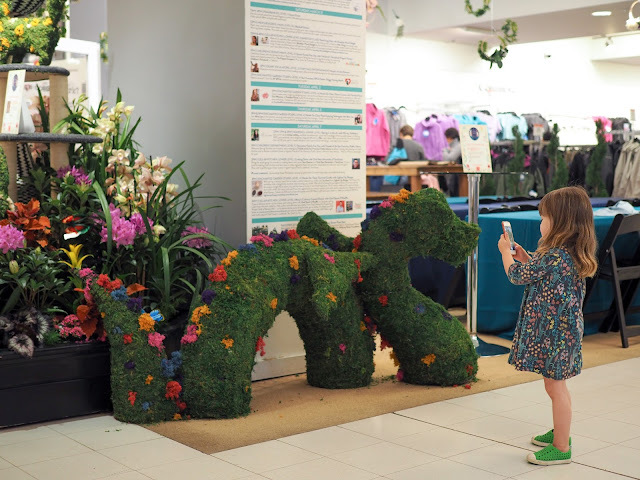 Mathilde was keen to take photos of everything with her iPod, so she snapped a ton of pictures - just like me! 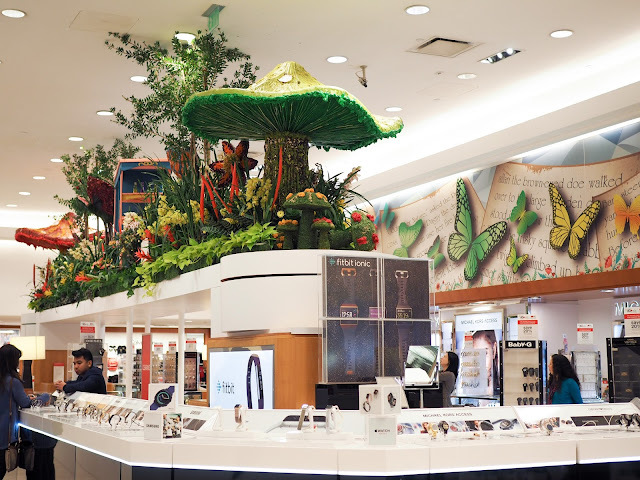 In the watch department we found giant toadstools and butterflies on top of the central display. 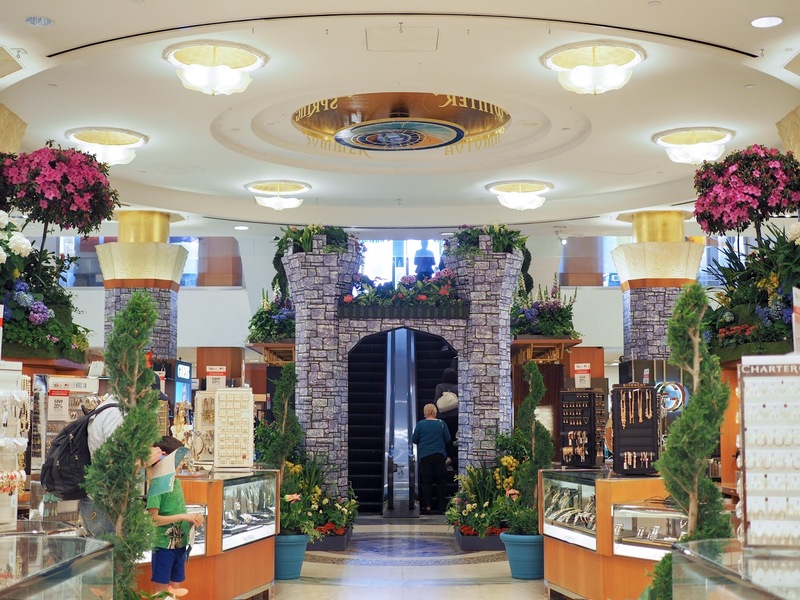 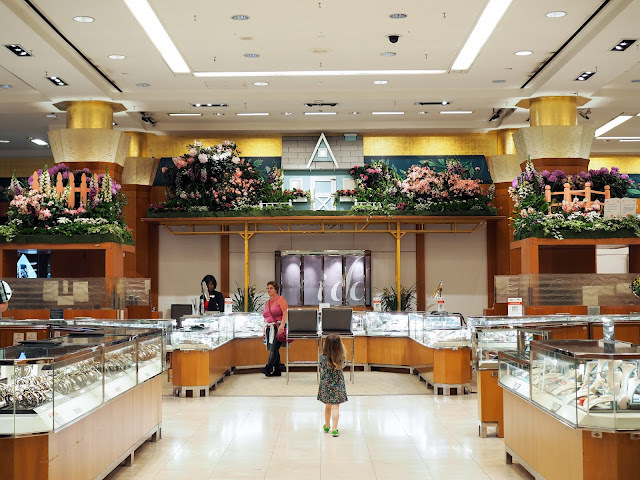 We then made our way into the accessories department where the fairy tale theme continued with a castle at the bottom of the entrance escalators, suits of armor, a storybook cottage, and more bunnies. The highlight, however, was the pink throne surrounded by an arch of flowers. 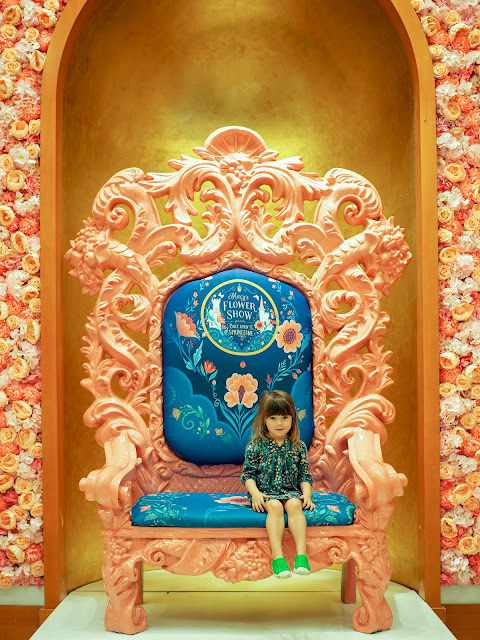 Mathilde was excited to climb up on the over sized throne - which you may recognize from here, but with a new paint job. I even managed to get into a photo too! 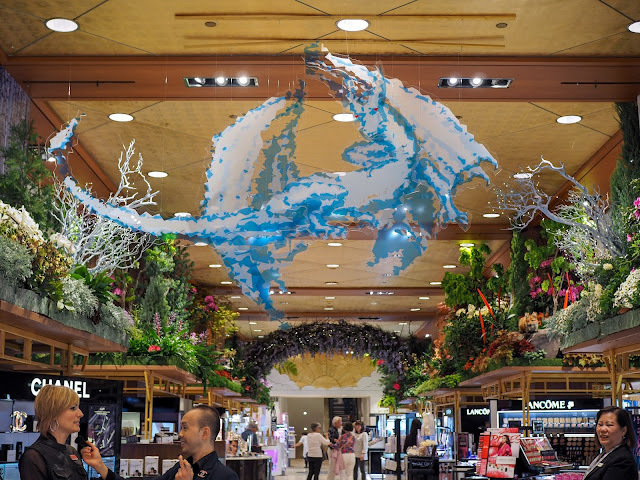 It did take several attempts though as the first person who took our photo didn't press the shutter button properly and didn't actually take any photos, and then the second person moved the camera each time she pressed the button and took super blurry shots. 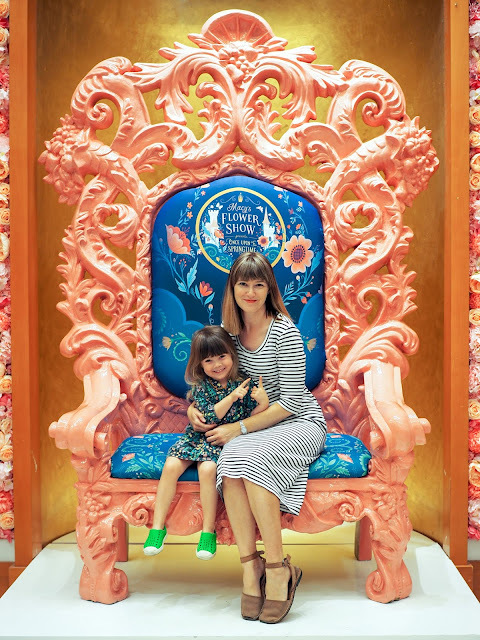 The third person finally took some better shots for me. And you wonder why I never appear in photos! 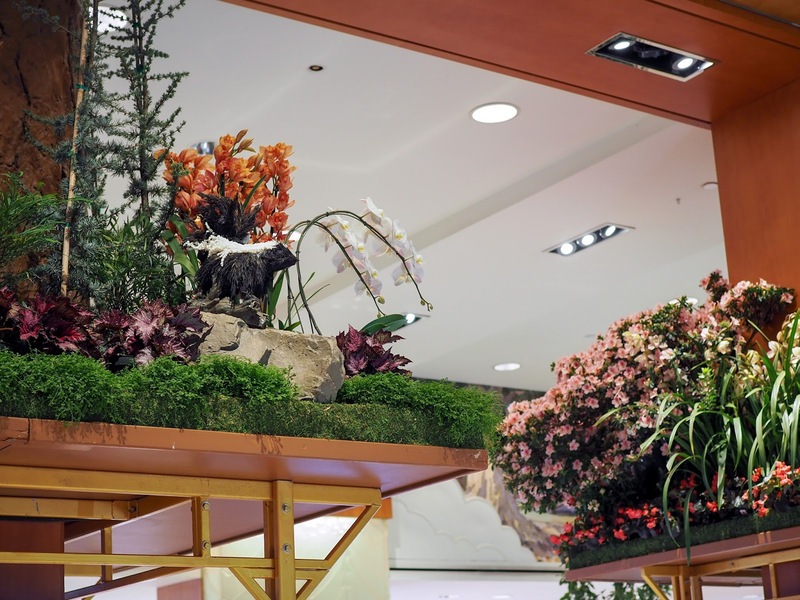 We then made our way to other floors in the store for a few more displays. 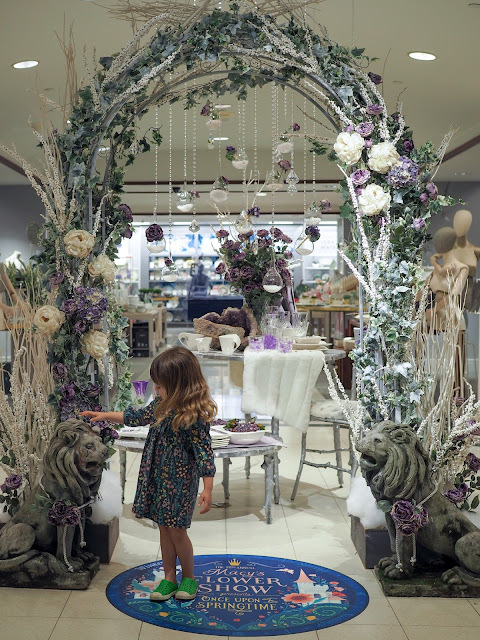 On the lower level we found a few beautiful displays with arches plus a few smaller, kitchen themed displays. 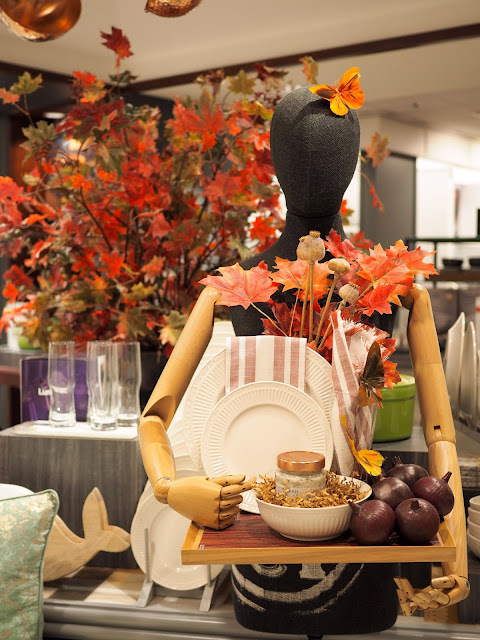 It was the kitchen department, after all. 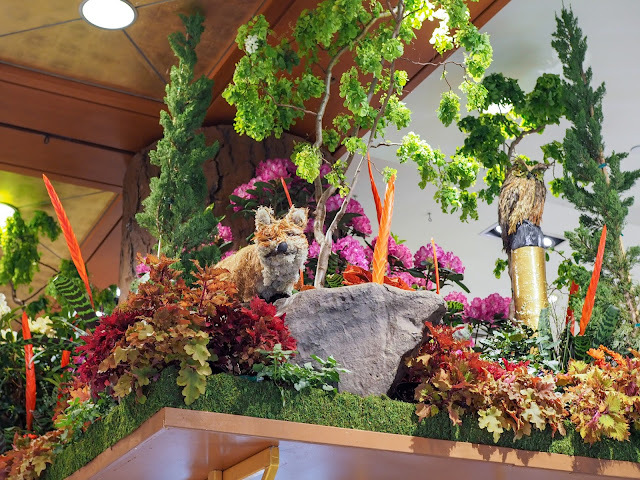 We then headed up to the fourth floor where we found a display featuring dogs, a cat and a dragon made of moss at the Enchanted Garden Studio, an area set up for workshops and talks. 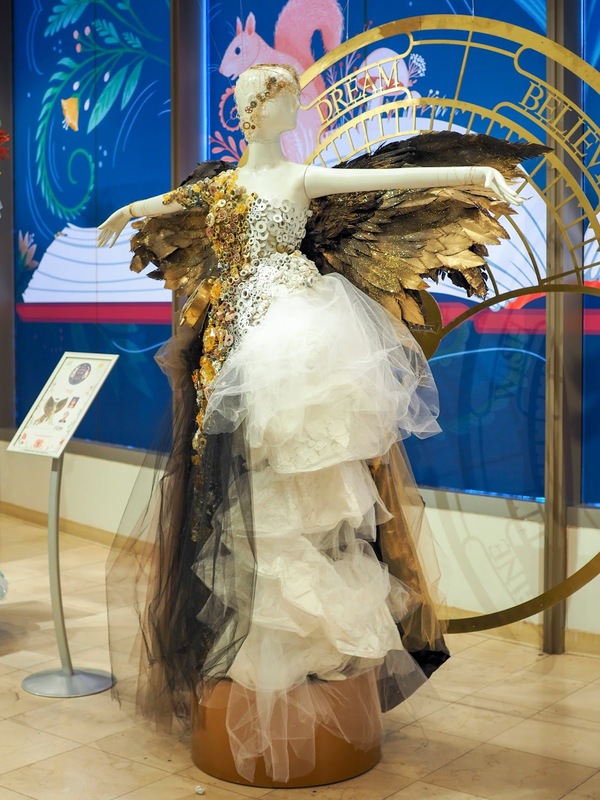 On the third floor we checked out the FIDM Four Seasons Through Time installation. 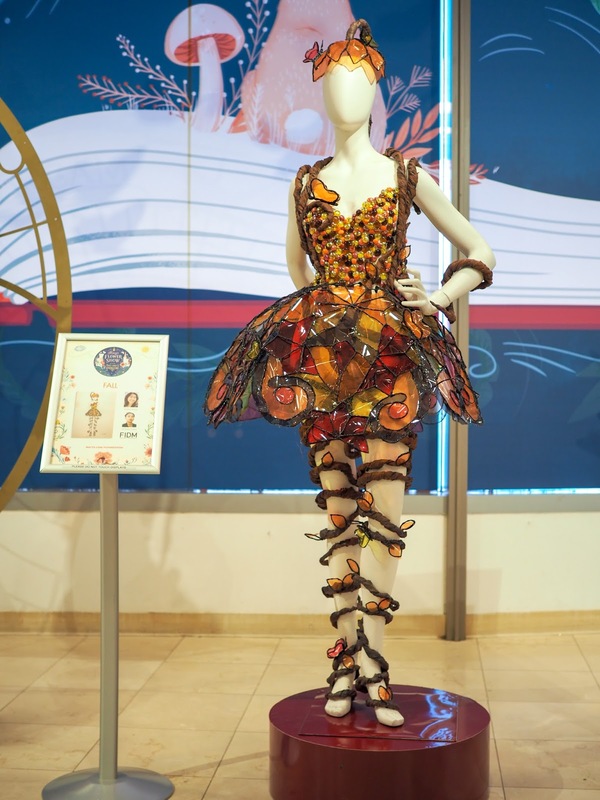 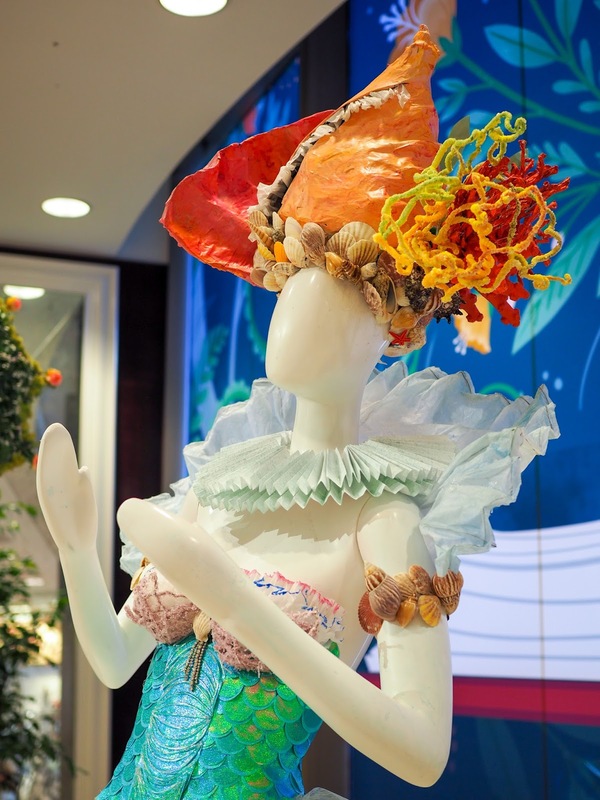 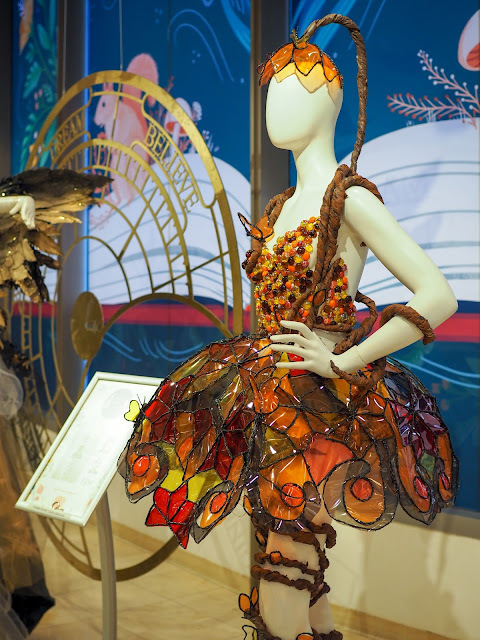 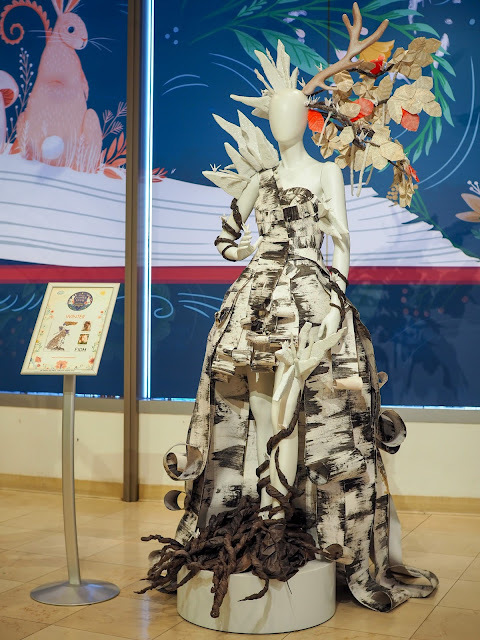 This display features amazing creations by students from the Fashion Institute of Design and Merchandising. 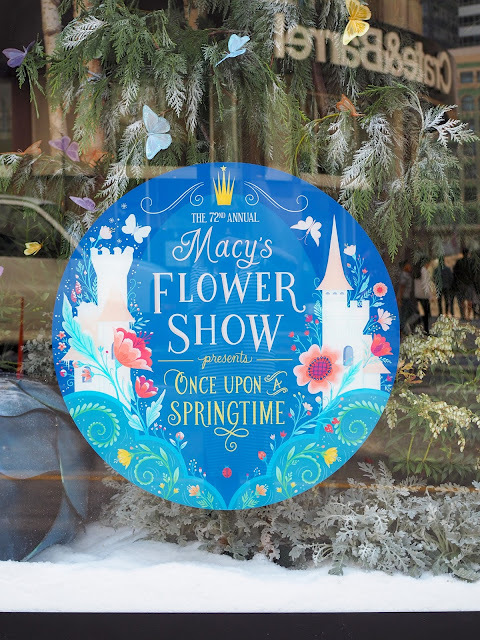 We took a little walk up into Union Square to check out two new hearts (including this one) as well as the front of the Macy's store which features a huge storybook image on the windows. 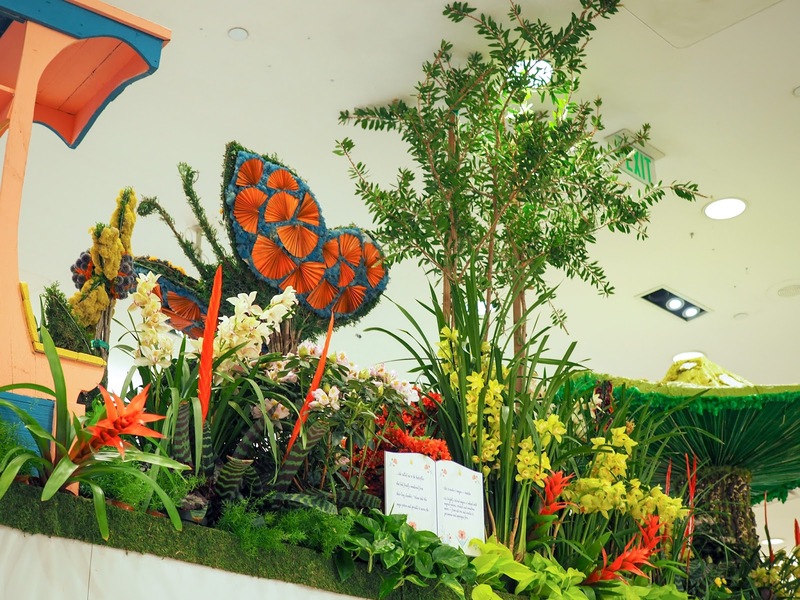 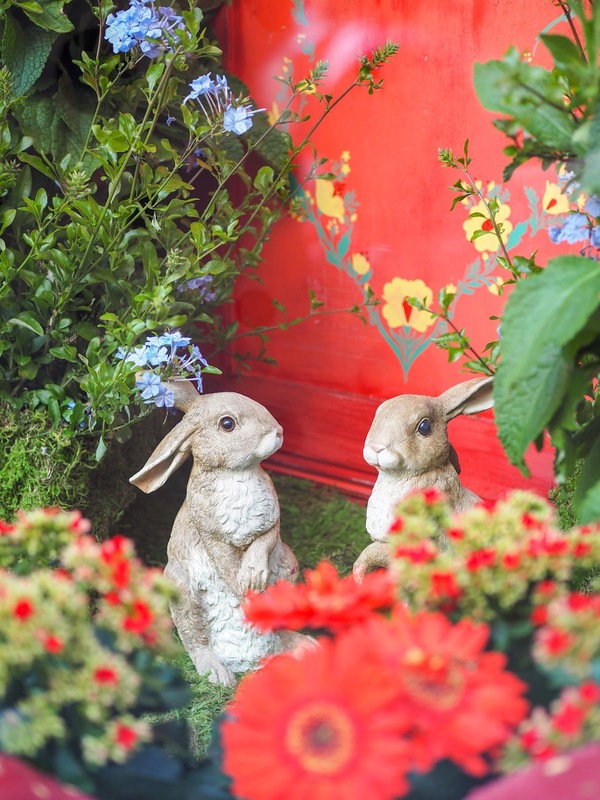 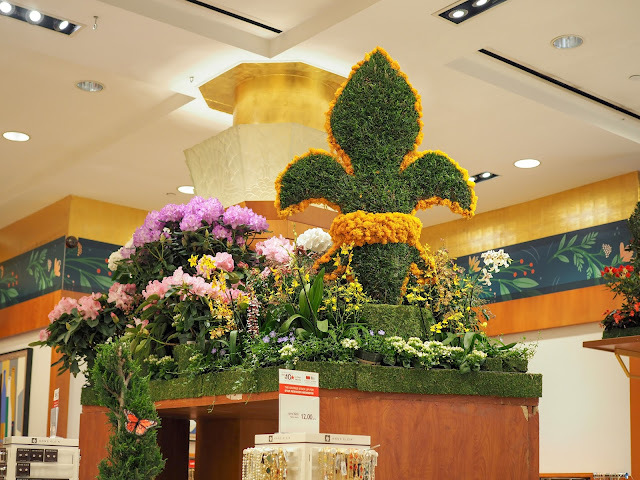 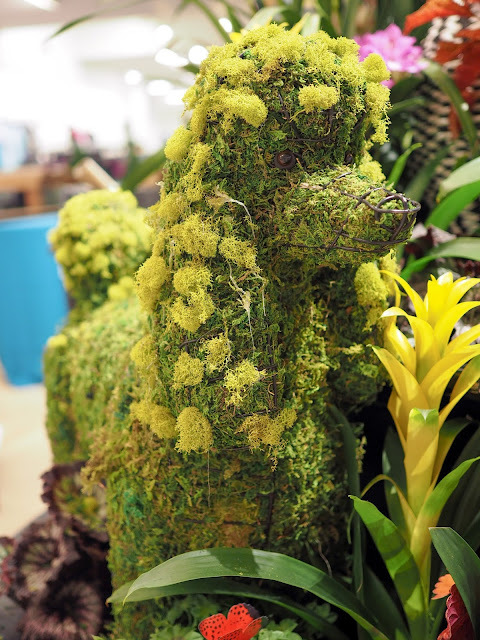 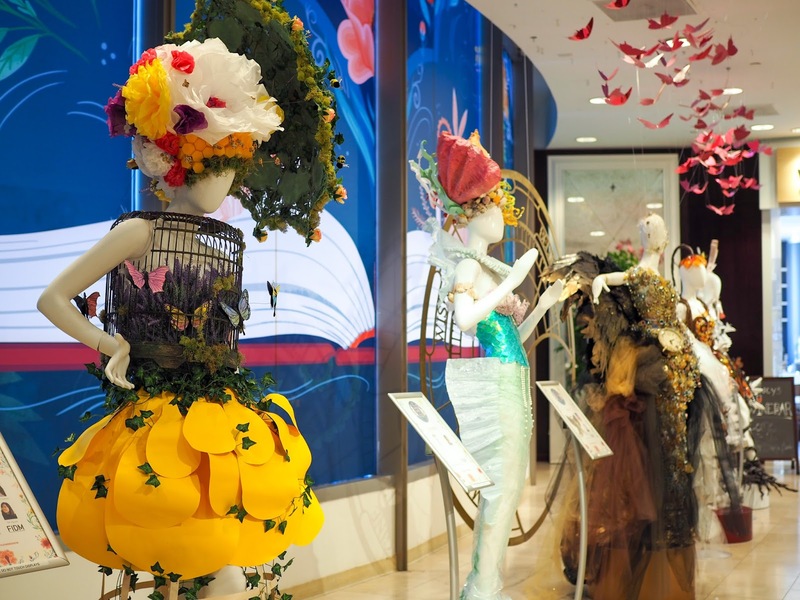 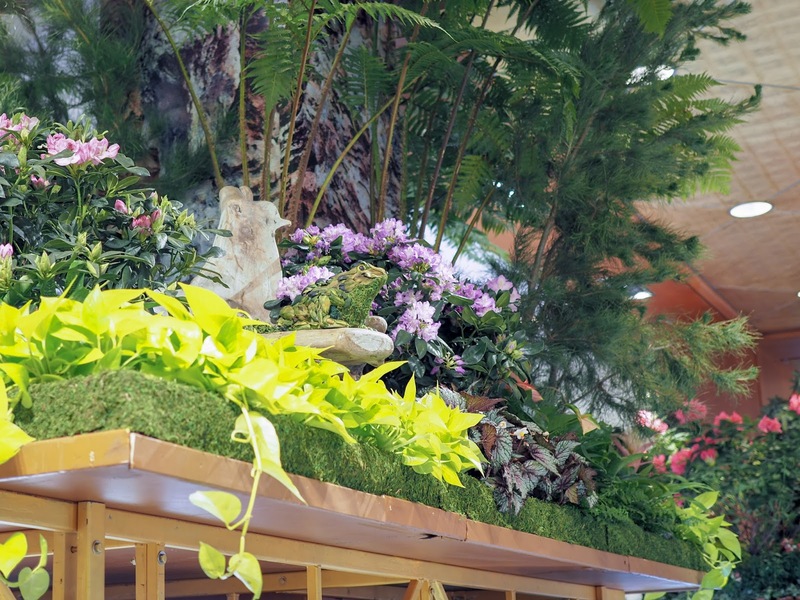 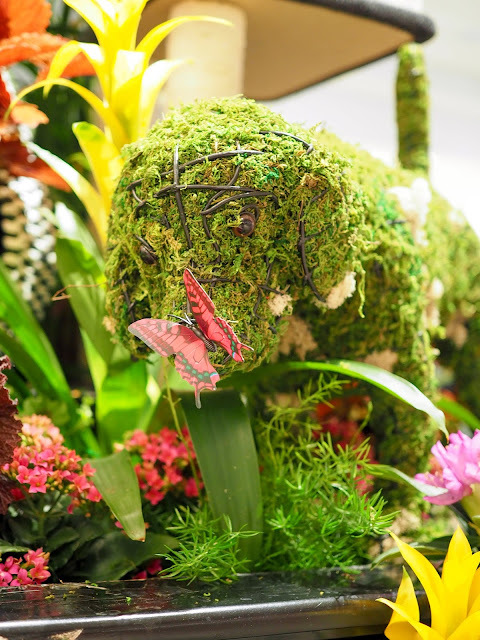 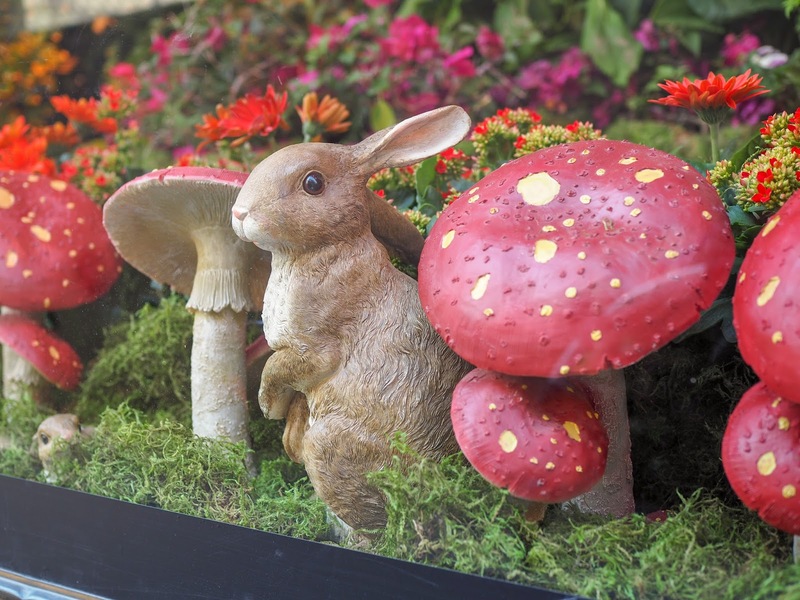 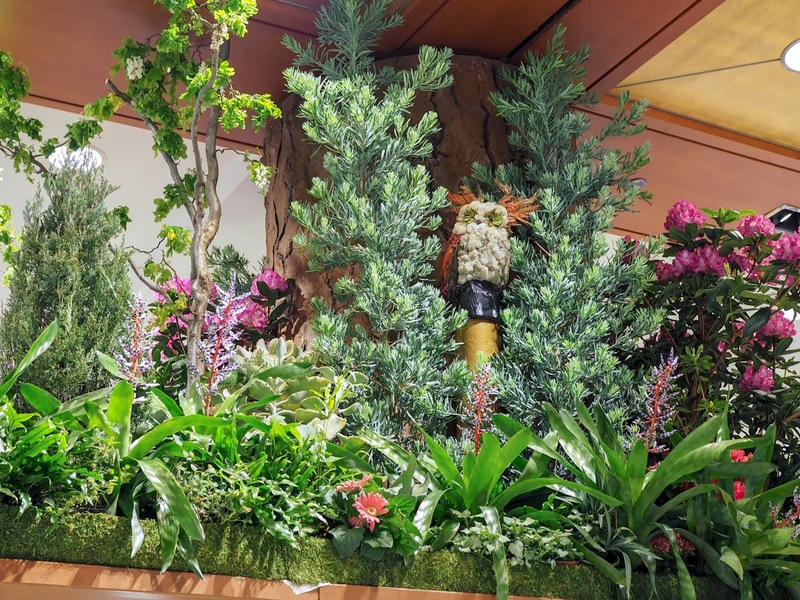 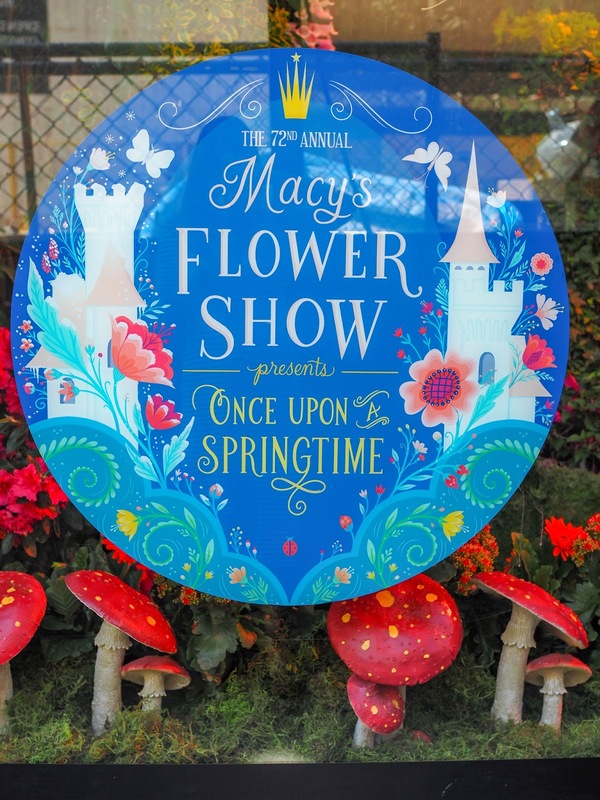 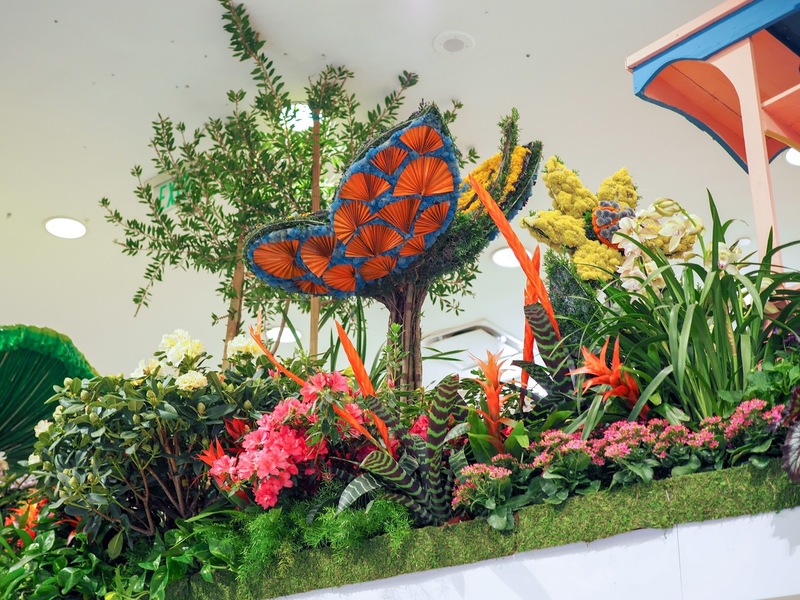 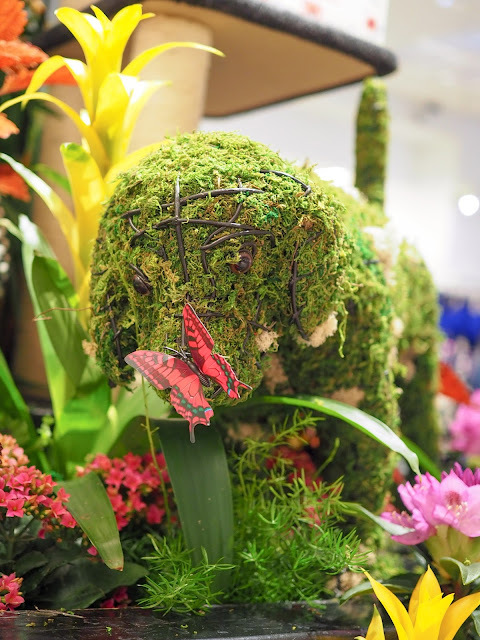 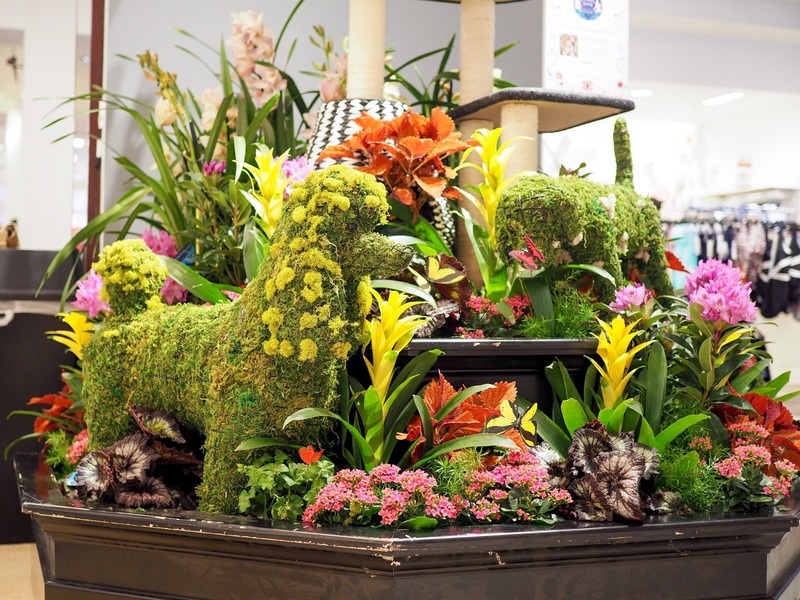 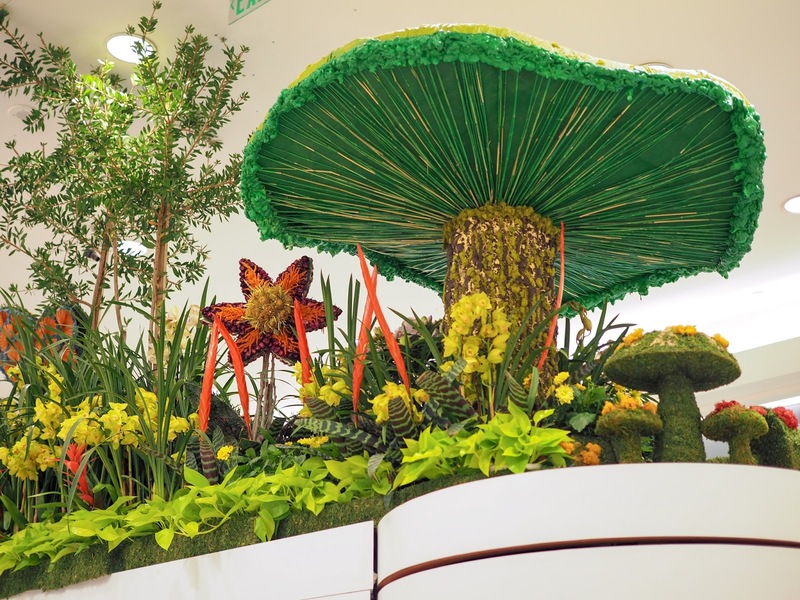 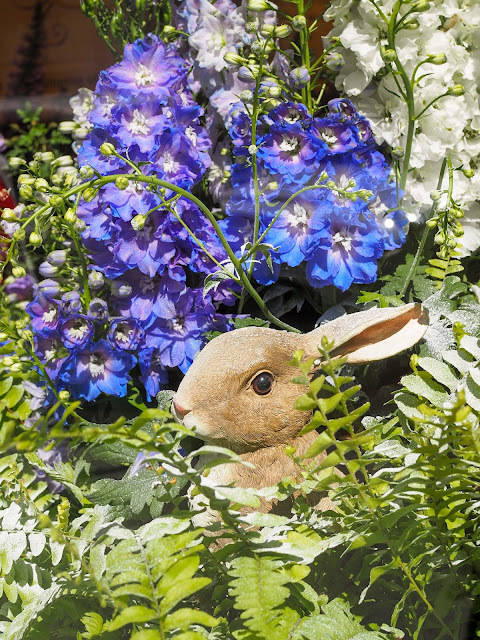 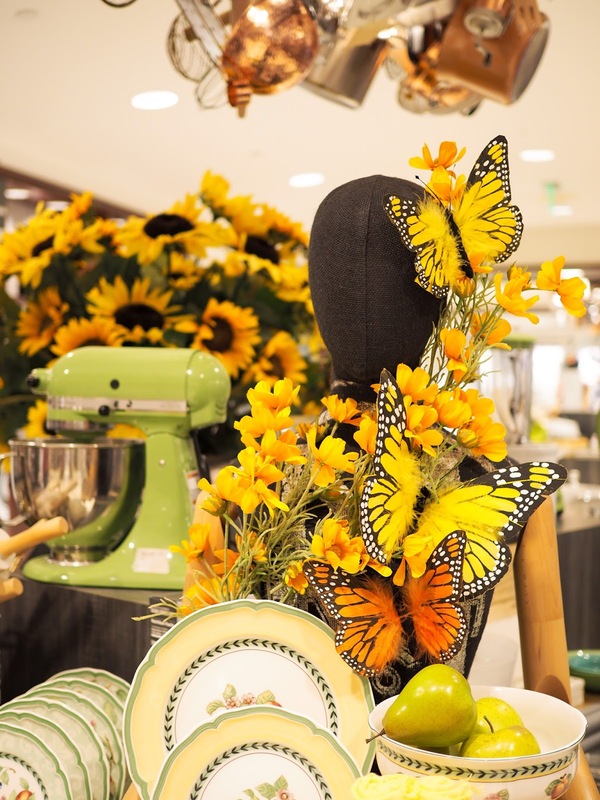 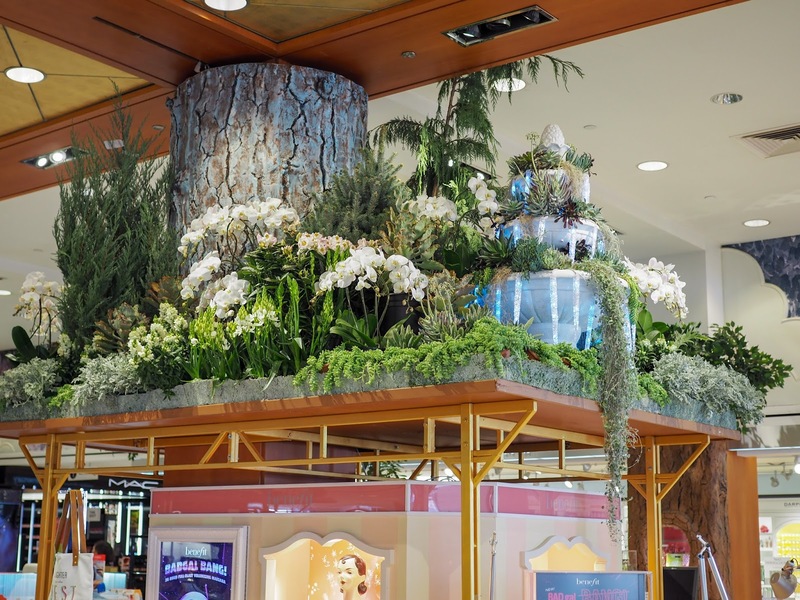 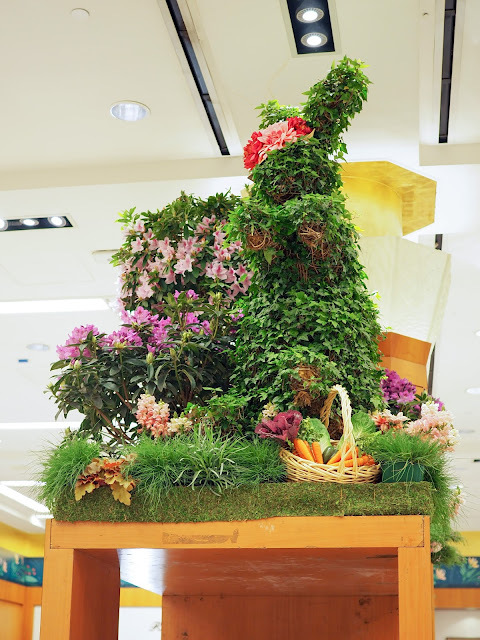 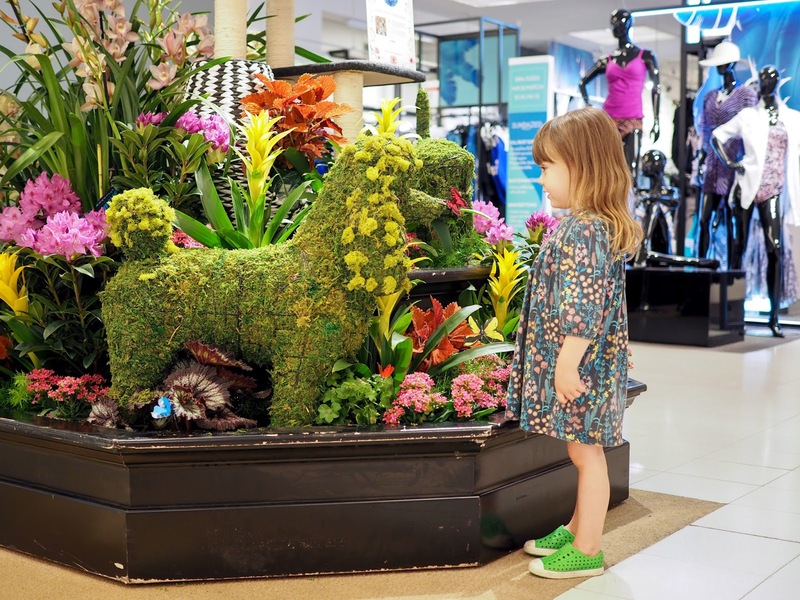 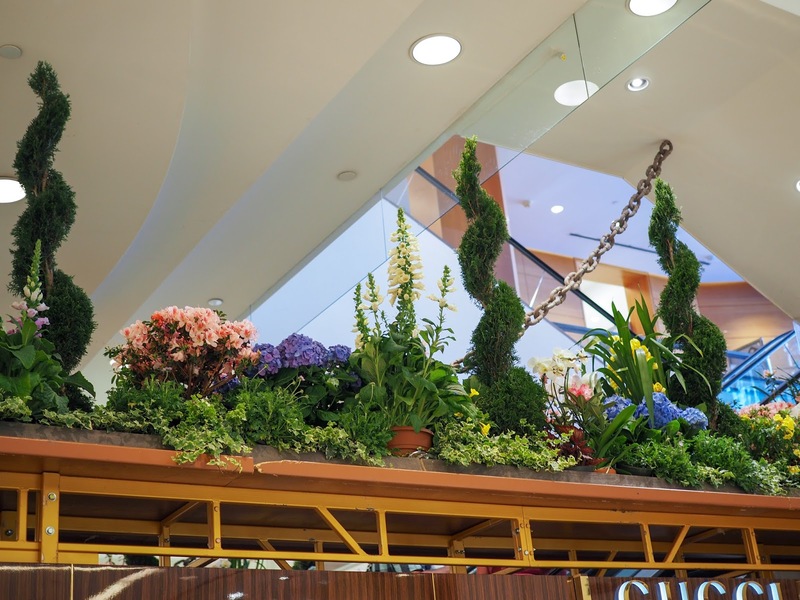 Macy's Spring Flower Show runs now through Sunday April 8th. It really is such a beautiful show, so if you love flowers like I do, I definitely recommend checking it out. You can find more information here.